Such a pretty sight isn’t it ? How gorgeous these greens are ! And freshness of other colors literally soothe the eyes.Yes,Summer is hot in Kuwait,Mercury touches 45 degrees ..phew !! 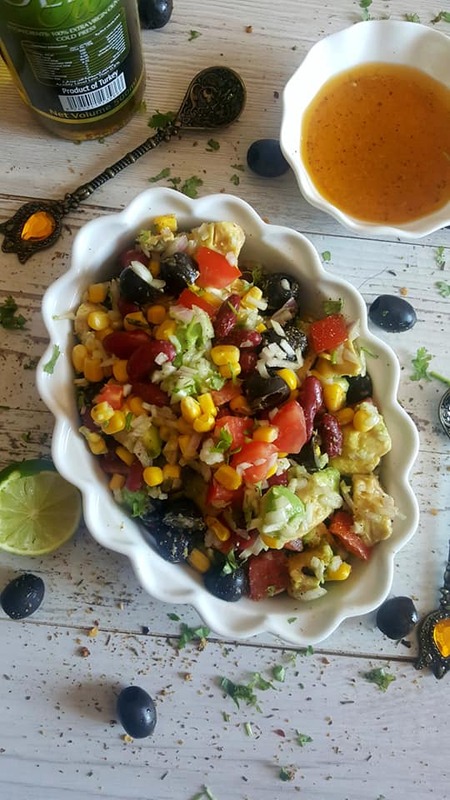 The scorching hot weather demands a morning meal that is preferably light and filling .This colorful and gorgeous treat on the plate is Avocado,Corn and kidney bean summer salad.Lovely concoction of colors and the flavor is so good . There are plenty of fresh veggies available in Kuwait round the clock , local and global . All possible organic veggies ,fruits,fresh green smoothies,all kinda gluten free flours,gourmet spices and hebrs and what not, everything is just a phone call away and that way life is blessed here ..Alhamdulillah(why shoulld I whine over heat instead be thankful ! ) . To try and include different healthy ingredients in my meals always fascinates me . Be it Quinoa or Bulgur or Tapioca flour, the list is unlimited (allow my future posts to reveal it more ). Creamy Avocados (the best one as far as I have used is from South Africa ) has tons of health benefits and various way of using it . Numerous studies show that it has powerful health benefits. It is Incredibly nutritious and contain a wide variety of nutrients , including it is rather unique fruit . While most fruits consist primarily of carbohydrate , avocado is high in healthy fats . some vitamins and minerals. The salad gets ready in no time ,you just need some basic vegetables and even the dressing is pretty simple. This is definitely going into the regular rotation all summer long .It can be serve as a side dish , light meal or snack. You can serve it with tortilla chips or crackers. Description : A Bright and Flavorful treat ! Wash and cut the avocado , tomatoes , red onion and cilantro . Keep everything separate. Whisk lemon juice , olive oil , cilantro , garlic powder and salt in a small bowl. Now toss together all veggies(not avocado ) with canned corn , kidney beans , salt and pepper. Pour lime dressing over veggies and toss to combine. Add avocado and toss gently so they don't mash together. Serve immediately or refrigerate for 30 minutes . Now thats meal packed with healthy fats , protein , fiber , vitamins and minerals . Enjoy ! Follow me on Instagram and Facebook for my dialy food updates.